Can you give the median as well? Really interesting analysis. I do some benchmarking work on the side so I can appreciate this info. 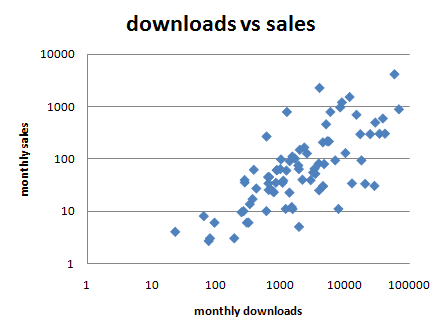 I would guess that the process of correlating “downloads” with sales is not as big a factor as it once was, and not improving in the indutsry as a whole. 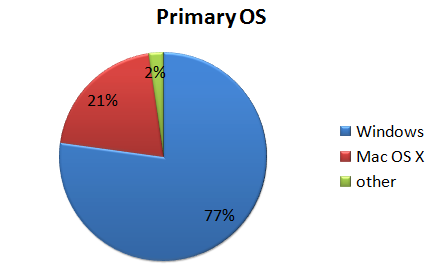 One reason may be that in the software world as a whole, more software is sold online, via outside affiliates, and driven more by SEO and marketing factors today, than desktop applications and PC shareware solutions. 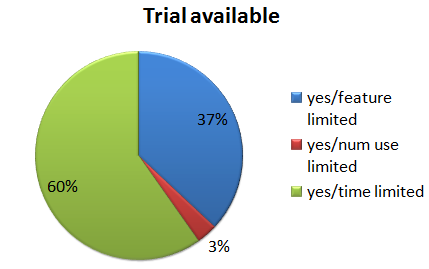 Also, as in my case, I don’t deliver a trial, as I sell website photo software and scripts directly, which are demo’ed online. 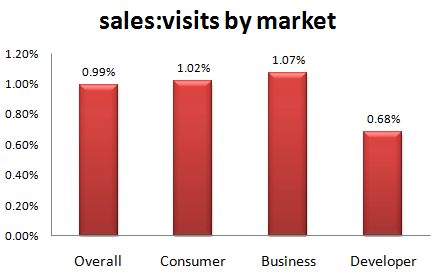 For that reason, I measure sales in terms of how well the site and SEO is doing. That also is affected by the software improvements. 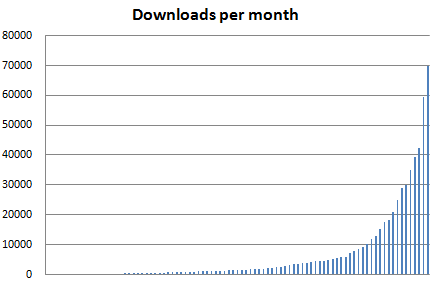 So, I cannot say, downloads is a factor for my. I do have a freeware version, but its not a sales tool, but a marketing tool and brand awareness issue for me. I only measure its affectiveness in terms of vistors who come to the site from the freeware, which isnt a big factor (ie < 1%), as it should be. Its not a sales tool, but a marketing tool. 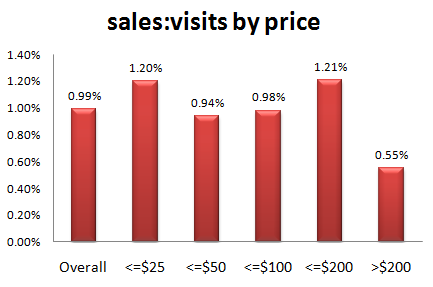 What I would guess is sales to site visits is a better metric, using weighted averages, and combined with Google Analytics factors, like bounce rates, goals, and time on site, could show and predict how often people buy a product from you. 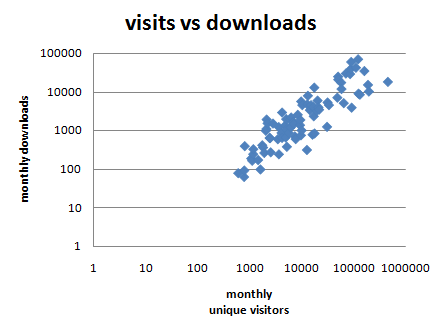 Downloads becomes yet another “key factor” in that formula, but not a benchmark metric. Also, saying you can expect 1% of sales is like saying, “it’s all a numbers game” and if I can increase traffic or downloads, I will sell more. We all know thats true, in a general sense, but the data shows that its increasingly hard to do, and only the top 10% get over 2%. 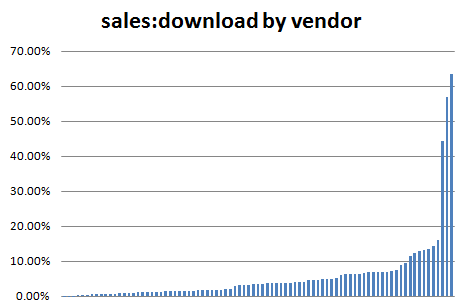 Therefore, downloads isnt a solid factor for improving sales. 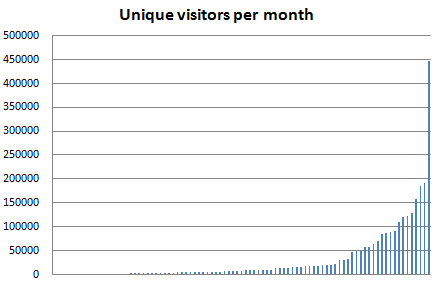 I think driving the “quality” of visits is a much better goal, if we could measure that. For example, users who visit a purchase page. That could include download people, non-download people, marketing campaign vistors, new visitors, returning, etc. 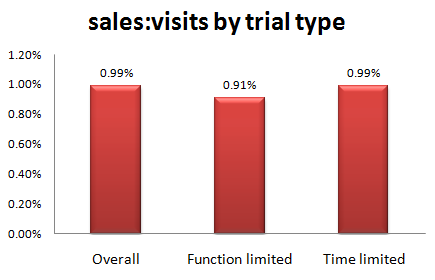 I would much rather have 5% sales from fewer people measured from all metrics, than 1% from one static group of customers that rarely fluctuates, simply because I know now all my software and marketing efforts are working better, and can have a radical impact on sales, regardless of visits and downloads. I guess I am getting into SEO here, but you get the picture. What a fabulous post. I’m a newbie Mac application developer and I’ve been struggling to work out how many unique visitors I need to pay my bills. Now I can base my predictions on hard data. This is really valuable information. Well done. Thanks again for all your hard work in getting us these really useful statistics. It’s fantastic to see some real data on this issues. Very nice work, the post is of excellent quality. Andy….Thanks for this thorough and insightful post. Thanks for taking the time, effort and interest to put this together and making it available. 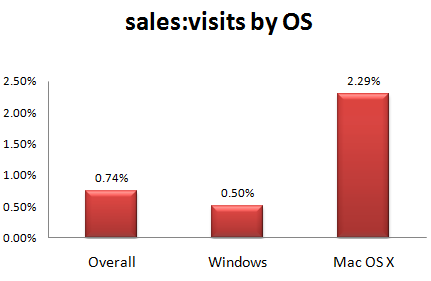 Pingback: The FastSpring E-Commerce Blog » Blog Archive » What Is A Typical Visit To Sale Ratio For Software Vendors? Looks like only 1 product in the roundup would satisfy that. Any ideas why? Is Red Gate just way over the top in that requirement? Or are most of the products in the roundup optimized for conversions? I’m getting ~0.5% download to conversion, so 10% seems way high to me. Very interesting post. 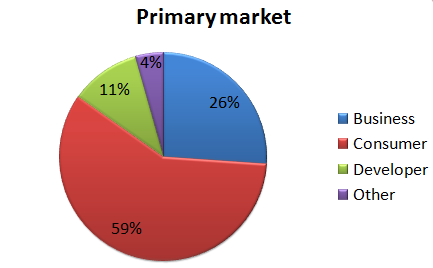 I have been working out my own numbers for my company, and I must say that our past two years of data look quite a bit better than your averages, but we are in a small niche market. It actually validated several of my metrics though, so thanks for sharing that information. I have read “The black swan”. Very interesting, although Taleb’s ego did get in the way a bit. 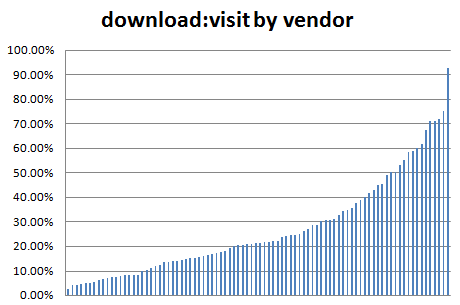 The fact that one vendor has nearly 3 times the sales:downloads of the next highest is rather suspicious. 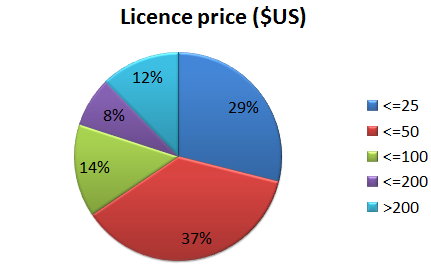 It might be because the data was inaccurate (e.g. 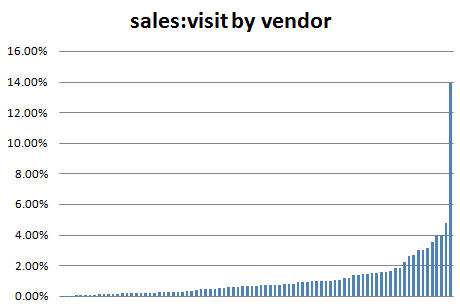 a missing 0) or that vendor used a different way of measuring the results to everyone else. In which case ignoring it is valid. In any case, I might have been better looking at the median conversion rate, rather than the mean, as the median is less sensitive to outliers. This is great. I am currently trying to work out conversion rates for our yet-to-go-live ISV for our cash flow projections. We were wondering if business software had a higher than industry standard conversion rate because its not a tire kicking type search. have you created some software that people want and then, its about communicating that to your intended audience. All easier said than done. I can now estimate the needed traffic on my site and budget a Google Adwords campaign. It would also be interesting to have the data available regarding different kind of products (games, business, engineering, web, etc.). Superb post, thanks. I wish I’d read this when you first wrote it. 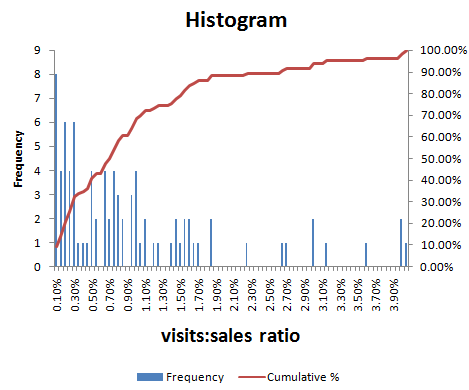 I’ve been trying to work out why my conversion ratio is low – turns out it’s not, basically. Nice article but a real shame the data have such coarsely rounded product prices because that introduces unbounded errors in any calculation involving the single most important quantity: money. 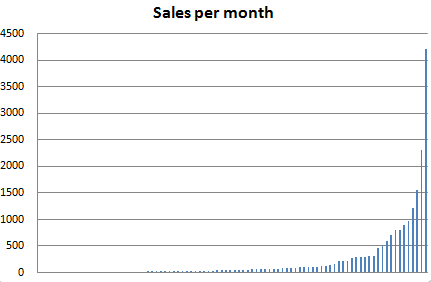 From my own calculations of our own product sales, our monthly revenue from a product is proportional to its unit cost. The more we charge, the more profit we make. Most of us require a lot more this sort of site owners just like you on the web and also a lot fewer spammers.